I hope someone got a chuckle b/c I’m not happy with today’s strip at all. XD It feels rushed and sloppy. Of course we love your comics Liliy! Wouldn’t be here if we didn’t. And this particular comic: hey it’s got Driver(plus for me), Security’s back(plus for everybody), and Mordred is looking as awesome as ever in that two-tone hair! I wonder if he’ll keep it? Hooray for Hnaef, too! OMG!!!!!! okay seriously i ADORE security. I’d go so far as to say this is a real peach of a strip. I love your comic! So where’d Wiglaf go? I was about to write and altered version of a certain infamous line from the movie Full Metal Jacket when I realized I don’t know if that would make you feel better or worse. So I’ll hold off on that joke pending permission. Seriously Liliy, don’t worry about it–as far as I can tell this is a hobby instead of a job for you and if you’re stressing over a hobby you’re probably taking it too seriously. If me writing that doesn’t help then perhaps you should do a splash page of Wiglaf the Destroyer in action for Sunday to get past it. I love Driver’s face when she realises she’s talking to thin air. But Security gets the best line – again. 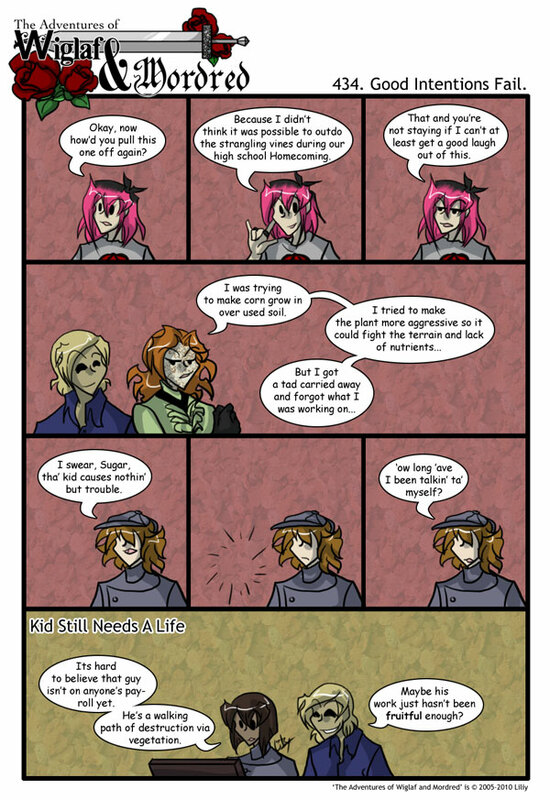 How about a companion comic – Mordred’s High School Days? “Strangling vines at homecoming” explains so many horror movies, and incidentally would satisfy my mother (who is sophomore class advisor and this week IS homecoming). Wiglaf is mowing the rows without Camlann. I am highly impressed. Maybe he stole Death’s scythe, a la Dante (new Inferno). ‘Ware the reaper, devil corn, ‘ware the reaper. I don’t see what the problem is, here, Liliy. You made a comic with two wcene changes, and each of the three scenes sports excellent characterization. It is a versatile and well-executed transition-to-next comic. XD dude, Blackford, that is the funniest mental image in a very long time! Wiglaf must already be off to save the world from Lancelot’s out-of-control mutant corn foodstuffs. He certainly received the news fast. XD And I’m sure that’s not all on his agenda. Wiglaf still has more things to do when he gets back: He has to forcefully eject Lancelot from the apartment, and he has to call in a doctor for his friend Mordred, who is lately hallucinating about floating pink women. XD Wiglaf’s schedule is packed. It’s not so much him being in denial as that he wants to be a hero that feeds the hungry and does all sorts of karma-whorish things like that. I love that pun. He could pair up with my mycology professor and do some serious damage. He could make the mutated plants, and she could make the mycorrhizae that would make them stronger!